This Presentation date is April 5, 2017 at 15:30 - 16:30 local time. Marc Cohn, Vice President Networking Strategy at The Linux Foundation, introduces the delegates to the Foundation’s project portfolio related to networking and orchestration. This started back in 2012 with OpenDaylight, the SDN controller framework. 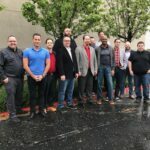 Today, their offerings have moved up the networking stack with numerous other projects, including PNDA, a big data analytics project designed to work across data centers. 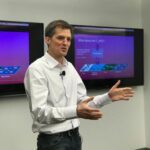 John Evans, Distinguished Engineer at Cisco, gives an overview of PNDA, an open source project that provides an abstraction layer to better handle big data in network application development. He shows how the platform can be used to break down network information silos, giving a pipeline from that data to established analytic practices, without having to have big data expertise on the networking side.